I thought #5 might be Rodzyanko. I think that number 5 could be portraying a Japanese officer. I think it resembles the ‘oriental’ war-time representations of the Japanese… the squinty eyes, bald head, goatee, large ape type ears and not to mention he’s really fat…I might be way off I’m not sure. I have no idea about number 7…. I thought he looked like an old-school slightly mutant (Santa). I dono…lol – I think I just wasted your time – sorry!! 5 - I think it is Protopopov or Grabbe? 6 is Protopopov for sure. We know he was a friend of Rasputin's. 6 is Protopopov for sure. We know he was a friend of Rasputin's and here is his picture. 7 is definately a bishop or famous priest. He is holding an icon, so he must be a man of the Russian Church. 5 - "Old Man" Goremykin ? 7 - Peter A. Badmaev caricaturing the Tibetan medicine influence ? Goremykin certainly doesn't look like that. He has very characteristic sideburns and hairstyle. And Badmaev was a central-asian with normal oriental facial features. He had a round face and was not at all skinny. OK, here I am comparing the cartoon to some photos that I have. 6 is most probably Protopopov since he looks so much like the picture of him posted on this page. On the other hand by the time the above cartoon was drawn, Protopopov's hair was completely white. It also resembles Stolypin somehow, especially the curls in his moustache. 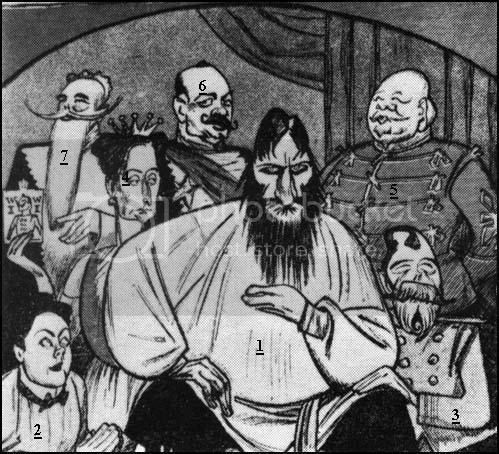 7 is definitely Sturmer, although this being a cartoon, the length of his beard is exaggerated. "Alexandra" is holding up a card with W W I I written on it and what appears to be a picture of the Kaiser (I am guessing by the distinctive mustache) or some sort of stereotypical German officer. #7 is pointing to it. Could this be a prediction of some sort? What's the background of the caricature? 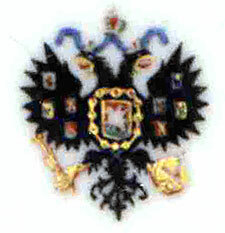 Count of Court Vladimir Nicholaeivich Voeikov is No. 6, i think.